Kristian Regale, Inc. is proud to announce updated labels on its entire line of Kristian Regale sparkling juice beverages. In addition to crisp new graphics and a vibrant color-scheme, the new labels emphasize Kristian Regale’s Swedish recipe and heritage (and deliciousness), while simultaneously promoting the product’s category-leading nutritional content. 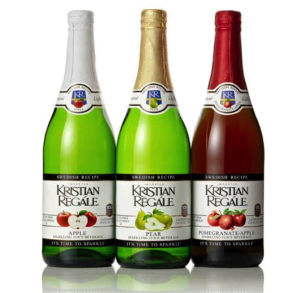 The updated Kristian Regale labels began shipment in January 2012, and rolled out across the entire line of products in April 2012.